Over two years ago my first post on the Neppl family presented what was known about them. One great grandmother, Maria Schaffer Neppl, in particular was eluding me. About eighteen months ago my post shared how a distant cousin named Lee had encountered the first blog post about our common Neppl ancestors. 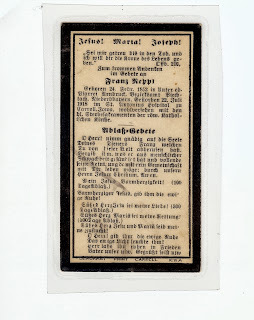 At the time he offered to send me a funeral card for Maria's husband Franz Neppl. It is truly a family treasure. Then, about two weeks ago the post was on how a major brick wall was overcome and Maria and her family was located. Shortly after that I began to be prompted that I should fulfill my commitment to translate the funeral card and send Lee the translation. 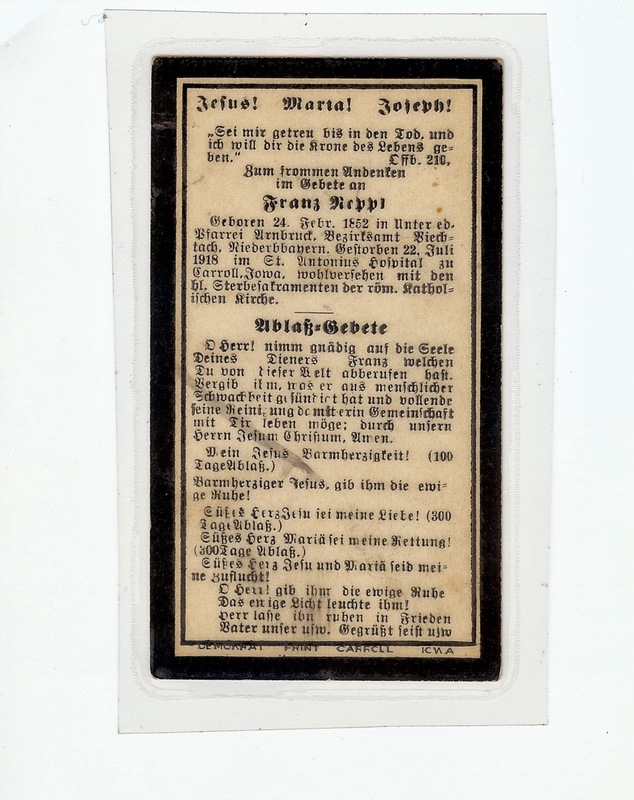 Finally a prompting came to contact the Carroll County, Illinois genweb moderator to see if the German translator who had done so much work for the group could possibly translate the funeral card as well. Regardless I offered to let them post a copy of this family treasure on the website so others can enjoy it as well. Last Tuesday I was pleasantly surprised to receive an email with a wonderful translation of the card. The first thing I did was email a copy to Lee and again thanked him for his generosity. It will be posted at the end of this post. Shortly after this, while working in our kitchen I decided to dust some little birds that have been in the window sill since I was given them when my grandmother Helen passed away in 2006. To my surprise the second set of birds have the following stamped on them, W Germany. If there is anything else that originated from Germany in our home I would be greatly surprised. While these probably were not handed down I will continue to associate them with my grandmother whose grandmother was Maria Schaffer Neppl. Maria died in 1889 at the age of 35 in Carroll, Iowa, when her daughter Louise was three, leaving a family of eight children. Helen's mother Louise died in 1932 in Brunswick, Nebraska at the age of 46, when Helen was twenty-two, leaving a family of ten children to be raised by their father. The last of this female line Anna Ranziger died in 1882 at the age of 54 in Stanton, Texas, leaving a family of nine children. This line of female ancestors died fairly young and makes my mother's death at the age of 78 feel like she lived a long life. The research for the Neppl family goes on and now includes the Schaffer family. The Schaffer family only stayed in Carroll, Iowa from 1875 when they emigrated from Germany until about 1882 when they migrated to Texas. At first it was hard to understand why they would travel 1,000 more miles southerly to Texas, but on Wikipedia is an article about the beginning of a new German society in this town. Maria was the only member of her family to remain in Iowa. Some moved to Kansas, Oklahoma, or Texas, others to Arizona, California or Oregon. Her older brother John actually lived for a time in Clackamas County, Oregon, not far from where we live. The serendipity moments come as I make these discoveries and I can't help feel that my mother is guiding me on in this research. The little birds will be a wonderful reminder of the many memories we shared and how proud she was to know of her heritage. Thank you Mom for helping me in this pursuit. 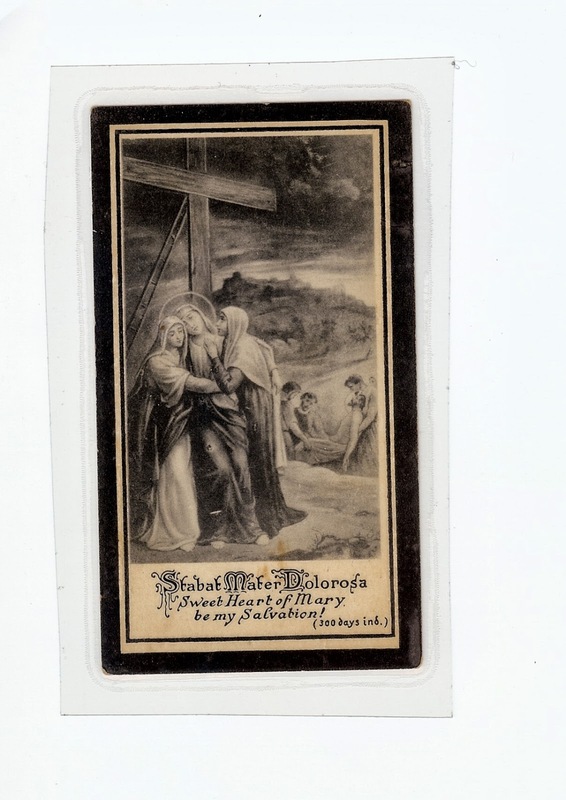 Born 24 February 1852 in the Parish of Arnbruck, Biechtach, Lower Bavaria. Died 22 July 1918 at St. Anthony’s Hospital in Carroll, Iowa, having faithfully received the Last Rites of the Roman Catholic Church. O, Lord! Graciously accept the soul of Your servant, Franz, whom You have called from this world. Forgive him his sins committed through human frailty and redeem him so that he may live in harmony with You, through Our Lord, Jesus Christ, Amen. Merciful Jesus, grant him eternal rest! Sweet heart of Jesus and Mary, be my refuge! O, Lord! Grant him eternal rest and let perpetual light shine upon him! Lord, may he rest in peace. Our Father etc. Hail Mary etc. 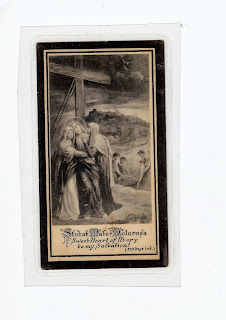 Stabat Mater Dolorosa (Latin text) A hymn about the sorrows of Mary.